NeoMAD features - A single API to rule them all ! With the Generic API supplied by NeoMAD, a single code is all you need to develop your native mobile applications thanks to our cross-platform approach. Whether for the business code, lifecycle management or user interface, you’ll only need to use a single API for all the equipment you want to address. 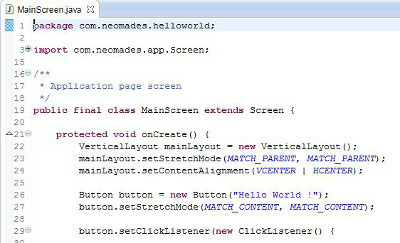 NeoMAD has an advanced layout mechanism to define optimised user interfaces for each platform and format. Choose the solution which suits you best to describe your user interfaces. NeoMAD enables you to simply separate the UI from the business code by describing your interfaces in seperate xml files. In order to start using NeoMAD as quickly as possible, we’ll provide you with a ready to use version of NeoMAD, pre-packaged with Eclipse. You can also keep your existing work environment by separately downloading NeoMAD and its plugin for Eclipse. The NeoMAD plugin for Eclipse also provides a debug function for Java platforms. Place your break points directly in your NeoMAD code and pilot Android, Java ME and BlackBerry debuggers from Eclipse. You can also debug for other platforms by generating native projects and opening them in their respective editors. If you’re used to another development environment: NeoMAD is also a command line tool and therefore easily integrates with other market IDE’s. NeoMAD proposes an advanced mechanism to extend its functionalities. You can embed native code in your projects, Java for Android, BlackBerryOS and Java ME, C# for Windows Phone, Windows 8 and Objective-C for iOS; this embed code will be processed by the NeoMAD compilation chain. Thanks to this mechanism, you can access functionalities specific to each platform, embed code which has already been written for a particular target and even access components which are not yet available in NeoMAD. The following example illustrates this functionality. In order to be able to natively access the different components of each target and enable the NeoMAD compilation chain to recover native code written sources, all you need to do is declare a particular class in the project and define the methods to be subsequently implemented. NeoMAD provides an assistant enabling the corresponding empty implementations to be automatically generated. The example provided here enables a url to be loaded in the native browser of each target. This function is already available in NeoMAD and is therefore provided here for demonstration purposes only. The following code corresponds to the implementation of the openURL() method for Windows Phone and Windows 8 targets. The following code corresponds to the implementation of the openURL() method for iOS targets. The following code corresponds to the implementation of the openURL() method for Android targets. 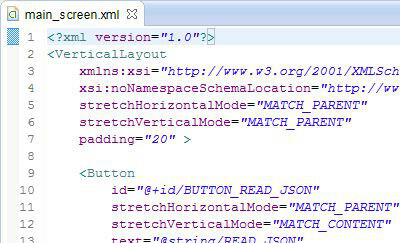 Each NeoMAD project is described by a particular xml file: the URS. This URS file enables the application’s settings to be defined (name, author, version number, resources, permissions, etc). Each NeoMAD project also has a constants file (Constants.java), enabling the behaviour of your project to be modified at compilation or execution time. Combining these two files provides great flexibility, thus enabling different binaries to be created from a single project (cloning). The following case, which you will find in the example provided with NeoMAD, illustrates this conditioning mechanism. In this example, we define an application whose name and login will be defined at binary compilation time. In this constants file, we declare variables which will be interpreted at binary compilation time according to the compilation settings. In this case, these variables enable our application’s background colour, name and login to be modified. All you need to do is specify the correct compilation settings to create 3 different binaries from a single project.